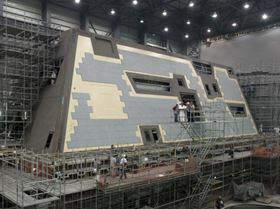 The deckhouse for DDG 1000, the first Zumwalt-class destroyer, is currently under construction at Ingalls Shipbuilding's Composite Center of Excellence in Gulfport, Mississippi. The funding for this contract allows Ingalls to purchase material and equipment in support of DDG 1002 advanced construction activities, as well as provide engineering and production support services. Ingalls Shipbuilding, a division of Huntington Ingalls Industries, is already building the deckhouse, hangar and peripheral vertical launch systems for DDG 1000 and DDG 1001. The Ingalls Composite Center of Excellence is home to the world's largest numerically controlled, five-axis saw capable of sawing, drilling and milling very large composite components to highly accurate tolerances. The facility has more than 322 000 ft2 of manufacturing space. "Strategically, this is a very important contract to our company and specifically to the composite shipbuilders working in Gulfport," says Karrie Trauth, Ingalls Shipbuilding's DDG 1000 programme manager. "The Gulfport facility is a national asset in terms of composite capability and capacity. Our shipbuilders continue to prove this on a daily basis with the significant work they are performing in composites for US Navy shipbuilding programmes. With this funding, we can prepare our facility and provide the necessary resources for our talented shipbuilders to continue working on these complex products." Huntington Ingalls Industries (HII) designs, builds and maintains nuclear and non-nuclear ships for the US Navy and Coast Guard and provides after-market services for military ships around the world. 3D Systems says that it plans to qualify metal additive manufacturing (AM) technologies to build naval warships. GKN Aerospace has won contracts from Airbus Safran Launchers to develop and manufacture rocket engine sub-systems.